The world is so full of bridges that all people want to hear about now are the most unique ones; Which is the longest bridge in the world? Which is the highest bridge in the world? In this post, I will try to answer these question extensively. I will show you all the bridges that have qualified over the last few years to be called the highest in the world or the longest bridge in the world. Before we begin, bear in mind that bridges are categorized in certain ways. For example, the longest bridge in the world over water might be different from the longest bridge in the world over land and the highest bridge in the world might differ depending on whether it was built for people alone, for vehicles, or just for trains. Additionally, how continues the bridge is, i.e., is it broken by tunnels or road extensions, count. With this in mind, let’s begin. Travel with me to China for a couple of minutes, let’s take a look at some incredible Glass bridges. Opened on the 24th day of December, paved with no less than 1,077 glass panels and now a great tourist attraction is the China glass bridge which ranks as the longest glass bridge and the highest bridge in the world at the moment. Being made of glass, one would expect this bridge to be lightweight or something, but this is not the case. Every one of those glass panels is 1.5 inches thick and the entire bridge in itself weighs a staggering 70 tonnes! Contributing to attracting an amazing amount of tourist traffic each year is a strange feature. This bridge has got a strange gentle swinging motion that makes it a wonderful thrill for visitors. But that’s not all, though, there’s the crack effect. This is where the glass flooring of the bridge appears to shatter under your feet as you walk over it. This amazing glass bridge was built by the renowned Chinese constitutions firm, Hebei Bailu Group, and according to them, the swaying motion was a deliberate addition to entertain tourists who flock to it to marvel over the awesome scenery laid out all around. Some people are uncomfortable with this feature, though. The feeling of standing at over 3,000 ft high up in the air and having the transparent platform under your feet swinging to and fro over a massive gully of a canyon like its going to come apart at any moment is just too much for some people to bear, though, and these people can be seen being dragged across the bridge by laughing friends or crawling across the bridge on all fours with clear terror on their faces. We are talking grown people here. Watch the video below. This glass bridge, which lost its place as the longest foot bridge in the world only recently measures a staggering 1,410 feet long and its height from the ground makes it as high as a 70 story building. The China glass bridge is made of glass, right? So we would all expect the structure to crack at some point. Well, that’s exactly what happened back in 2015, but it wasn’t with this glass bridge. Located on the rugged side of a towering 3,540-foot-high cliff in the same Henan province of China is another glass bridge or rather a walkway. A glass pane on this walkway shattered under the weight of thousands of tourists, sending several tumbling downwards and leaving many screamed with terror. Glass bridges are extremely popular in China, and so other constructors of the structure quickly learned from that unfortunate accident. The China glass bridge at Hongyagu has the ability to support about 2,000 people at a go. However, it had to be shut down 13 days after opening due to overcrowding because thousands of tourists were flocking down to stand on it all at once and this raised public safety concerns on the part of the management. Today, only 500 tourists are allowed to stand on the China glass bridge at any point in time. Several of China’s glass bridges have it, but this new mega glass bridge takes things to another level. It’s a phenomenon known as the crack effect. Higher up in this post is a very funny video of terrified people on the China glass bridge. As people walk over the glass bridge, some parts of it actually seem to crack under their feet, frightening the life out of them as if the bridge is about to break up or something. Watch the video above. However, this strange phenomenon is actually part of the awesome design of this bridge. China is home to an amazing number of glass bridges and glass-bottomed walkways. Several have been constructed all across the country, but none like this new one. A day before the launch of this glass bridge, another was opened in eastern China that almost stole the title of ‘longest glass bridge in the world’. That title is a bit hard to stick with because the ‘bridge’ is technically a transparent walkway but the amazing special effect is awesome. The bridge is located high up in the lofty Wuhu mountains of the Anhui Province in Eastern China. It’s a 590-foot-high, 1,272-foot-long solid glass bridge that looks a lot like it’s going to shatter once a large number of tourists stand on it. Additionally, two large dragon statues positioned on top of the bridge produce smoke, giving the impression that one is walking through the clouds with dragons flying around. The highest bridge in the world is to be found in the Himalayan Mountains of Asia. It is located in the seemingly bottomless Ladakh valley between the Suru and Dras rivers that flow through the Himalayas. The valley, which is on the Indian side of Kashmir, is situated at an altitude of over 5,602 meters (18,379 feet) above sea level. Technically, it’s a Bailey bridge, just 30 meters (98 feet) long, and was built by the Indian Army in late August 1982. The highest road in the world – Kashmir, India. The highest bridge in the world lies on the highest road in the world, which stretches all along the lofty Himalayan ridge in the deep Ladakh valley in Kashmir. A Bailey bridge is merely a temporary bridge of lattice steel constructed or designed for quick assembly from manufactured parts. The design of the bridge is famous for its superb military application, and no surprises there since the architect, Donald Bailey, originally worked for Britain’s War Office during World War 2 when he first proposed the design. Troops of the United States army launching a Bailey bridge during the WW2. Image via Wikipedia. The first ever Bailey bridge was put to use in a North Africa military campaign around the middle of 1942. Are you thinking of the bridge which stands highest over a body of water? If yes, then the Royal Gorge Bridge located on the Arkansas River in the US state of Colorado is your answer. This bridge, which was built in 1929 at a cost of $350,000, spans 321 meters (1,053 feet) above the water running under it. Measuring the height of a bridge by its piers, the highest bridge in the world is the Millau Viaduct (in French: Viaduc de Millau) standing over the River Tarn which flows through the Massif Central mountains over in France. This bridge is more than 300 meters (984 feet) high and 2,5 kilometers (1,5 miles) long. The Millau Viaduct bridge over the River Tarn in France. In the United States, the longest bridge over a body of water is the Lake Pontchartrain Causeway, which is located in New Orleans. This bridge has a total length of 38,6 kilometers (24 miles) and was built, or rather completed in 1956. The Bang Na Expressway over in Bangkok, Thailand is much longer. It is 54 kilometers (33.5 miles) long, but can’t take a place here because most parts of it is merely an elevated highway. However, the longest bridge in the world is the 164,8 kilometer (102 miles) long Danyang–Kunshan Grand Bridge located close to Qingdao City in the Shandong province of East China. It was officially opened in 2011 and was built a whopping cost of $8 billion. And yes, it crosses a body of water. The mention of money here makes you think of the most expensive bridge in the world, right? Yeah, well, let’s answer that question too. 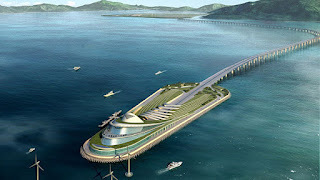 The most expensive bridge in the world is the Seto-Ohashi-Kojima bridge which is located in Japan. At just 1,322 kilometers (8,21 miles) long, this bridge, which was built in 1988, cost a whopping $8.3 billion. Interestingly, it also ranks as the longest two-tiered bridge system in the world. Why so expensive? The fact is, you don’t just build things in Japan. You build them to withstand earthquakes. In Japan, earthquakes are considered normal and they are all too common. The largest natural bridge in the world is the Rainbow Bridge. Now, where on earth does a bridge like that exist? It’s hidden away among the rugged and very isolated canyons at the bottom of Navajo Mountain in Utah, USA. This bridge is a natural wonder that pulls tourists each year. From its base (bottom) to the very top of the arch, this bridge reaches 88,4 meters (290 feet) high – in cooperation, this is nearly the same height as the Statue of Liberty in New York – and stretches 83,8 meters (275 feet) across the river below. The highest natural bridge in the world is in Utah. The top of the arch over the bridge is 10 meters (33 feet) wide and 12,8 meters (42 feet) thick. Talk about nature building a safe bridge! The only problem is, once you cross over, you might not be able to get down on the other side. According to records, the busiest bridge in the world is the Howrah bridge that stretches across River Hooghly in Calcutta, India. About 150,000 vehicles and four million pedestrians cross this bridge each day and it’s 457 meters (1,500 feet) long, spanning just 22 meters (72 feet) wide. The thing to note here, is that India, has the second largest population in the world, hence so many cars and people. China seems to be where all the incredible stuff is these days. After years of construction work, the country shocked everyone by unveiling the longest bridge in the world, which stretch straight out across the open seas to connect the Chinese mainland to its thriving islands, the chief of which was Hong Kong. Twisting and turning, the bridge spans on. The bridge also tunnels under the sea. 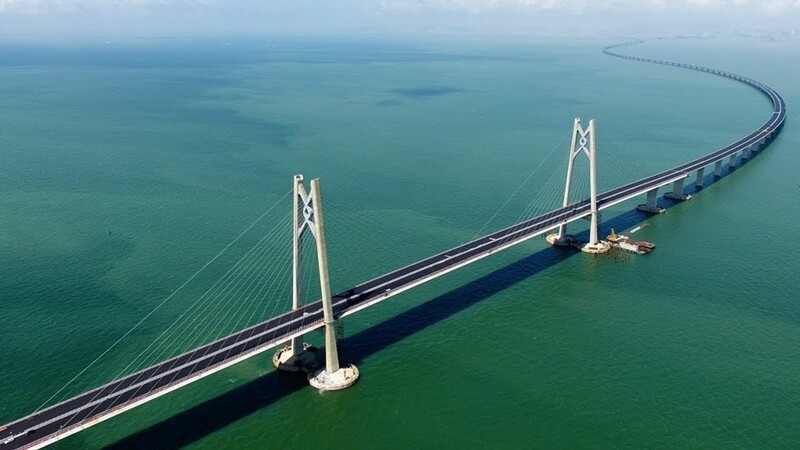 Twisting and turning, rising and falling, tunneling under the sea and out again, the Hong Kong-Zhuhai bridge, as of 2018 when it was officially opened by the Chinese president, holds the record as the longest sea bridge in the world. The bridge stretches 55 kilometers (34 miles), linking the island of Hong Kong to mainland China through Macau. This bridge is longer than the Pearl River Delta and many regard it as an engineering wonder.